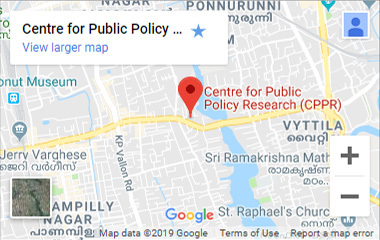 Centre for Public Policy Research (CPPR) hosts Muraleedharan Nair (China Expert & Formerly Indian Consul in China) for a talk on ‘Chasing the Chinese Dream: Xi Jinping at the 19th Party Congress’. The 19th National Congress of the Chinese Communist Party (CCP) is held at a time, when China is transitioning into a new model of economic development. From an economy that depended on investment-led manufacturing and export of low-value items to a nation producing innovative, high-tech products with a stress on developing the services sector and boosting domestic consumption. Can China maintain stability when the economy is visibly slowing down, and achieve its objectives of becoming a moderately prosperous society by 2020, and the world’s largest economy by 2030? Will General Secretary Xi Jinping be able to neutralise the resistance from different quarters, including the People’s Liberation Army (PLA), to the unprecedented campaign against corruption, and bridge the gap between the Party and the people? What are the chances of major economic and financial reforms being sacrificed, at least temporarily, in the interest of ensuring stability in the country? While Xi Jinping may not find it difficult to pack the incoming Central Committee, and even the Politburo, with his supporters, how far, if at all, will he succeed in doing so in the case of the all-powerful Politburo Standing Committee? What are the implications, including to the world, if he is, or he is not, able to achieve the latter? Muraleedharan Nair has held various positions with the Government of India. His postings abroad include those in the Indian diplomatic missions in Singapore, Shanghai, Hong Kong and Guangzhou, China.